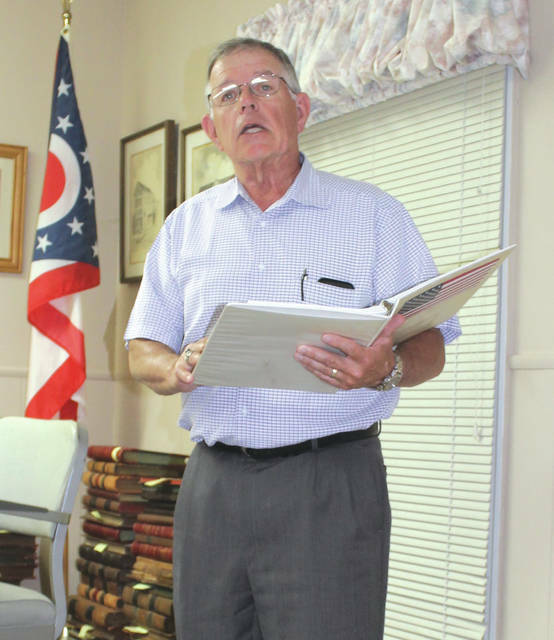 Linda Collins | Greene County News Greene County Career Center Board of Education President Michael Uecker made a stop at the Bath Township trustee regular meeting. BATH TOWNSHIP – Greene County Career Center Board of Education President Mike Uecker paid a visit to the Bath Township Trustees’ meeting Oct. 3 to rally support for Issue 2, which will appear on the Tuesday, Nov. 6 ballot. The proposed 20-year, 1.03-mill bond would help pay for a new, innovative career center that would be built at U.S. Route 68 and U.S. Route 35 near Innovation Way in Xenia. If approved, the new tax would generate approximately $4.1 million annually which would cost homeowners $36.05 per year or $3 a month for a $100,000 home. According to Uecker, who represents the Fairborn City School District on the board, the majority of the 17 career-technical programs would be moved from the current main campus, located at 2960 West Enon Road, to the more-centralized location. The new career center would also allow for the expansion of the “Take Flight Initiative,” a program that educates and trains students to enter the aviation and aerospace industries. Uecker said that a December 2017 community survey of registered voters in Greene County showed that more than 90 percent of the voters supported the “Take Flight Initiative” curriculum because of the connectivity to Wright-Patterson Air Force Base. “Since 1975, the United States dropped from third to 13th in the world for the percentage of 24-year-old men and women who hold engineering degrees. However, aerospace and defense industries have grown 20 percent over the last five years,” Uecker said. He also cited a local job market analysis which revealed a dire need for skilled workers in the manufacturing, engineering, and information technology related to the aviation industry. Uecker said Wright-Patterson Air Force Base is the largest, single-site employer in the state with 29,000 employees. Regional manufacturing employs more than 110,000 workers and contributes more than $6 billion to the region’s annual total payroll. Annual sales among local information technology firms, including cybersecurity firms, exceed $10 billion annually, and strong growth in the field of information technology is projected through 2023. “These jobs make up for the largest part of the labor market in Ohio, and many of them require an education beyond high school but not a four-year degree,” Uecker said. Part of the “Take Flight” expansion will also include technical programming for high school and adult students in the areas of aviation maintenance and unmanned aerial vehicles (UAV) engineering and operations. GCCC will use an $850,000 grant from the State of Ohio to launch the program which will include facilities and classrooms at the airport. Because of the number of hours required to receive a Federal Aviation Administration (FAA) certification, the program will entail a two-to-three-year training course. https://www.fairborndailyherald.com/wp-content/uploads/sites/50/2018/10/web1_bathtwpmeeting.jpgLinda Collins | Greene County News Greene County Career Center Board of Education President Michael Uecker made a stop at the Bath Township trustee regular meeting.